Tip: take the bus, and then you can spend the rest of the day in the bar next door. I remember when I was thinking about how to make the fifty special things work that one problem was always going to be budget. Having made the decision to try to make my fiftieth year a special one, how do you afford it all? 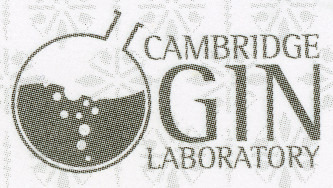 So it was with great delight that I received a gift of a gin tasting session at the Cambridge Gin Lab. It turns out that it is very popular, the day we went it was full up. I imagine other days are not dissimilar. 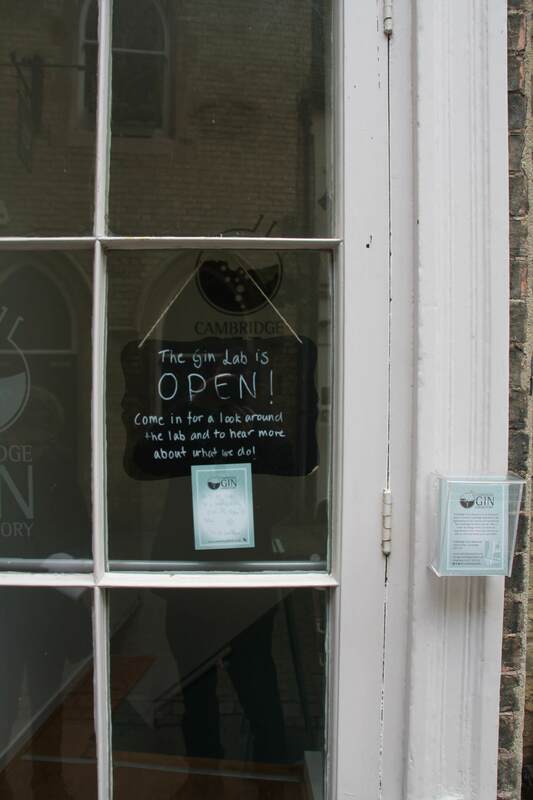 The Cambridge Gin Laboratory is at 10 Green Street, Cambridge. 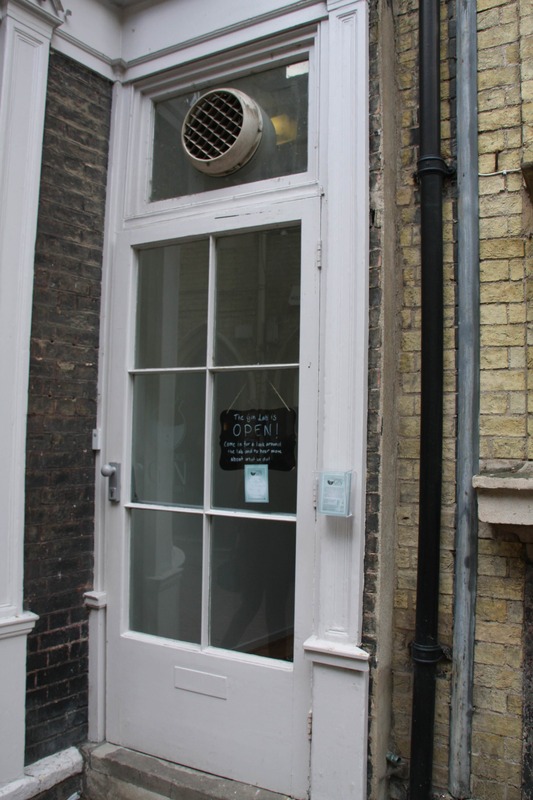 There is a board outside to confirm location and a sign on the door. At the time I was convinced that I was going to rule the world via the medium of blogging – such that there is quite a strong pictorial record. It was around the time of this visit that I began to comprehend just how fashionable gin had become and just how many people were keen to get in on the act. The lab is downstairs and is laid out with all kinds of gin-related paraphernalia. Prior to the gin sampling itself there is a very interesting talk on gin and the history of gin from which I made a few notes. 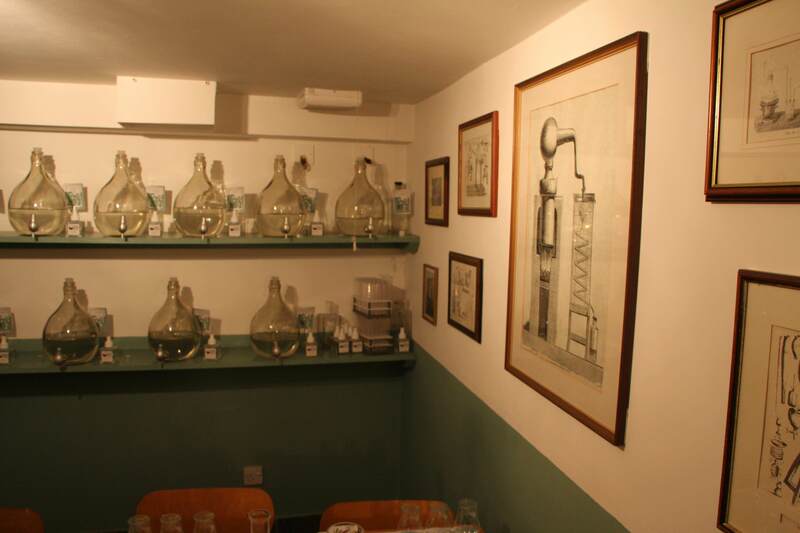 Note the picture of the black Labrador on the wall, said to be the reason why it is called the Cambridge Gin “Lab”. 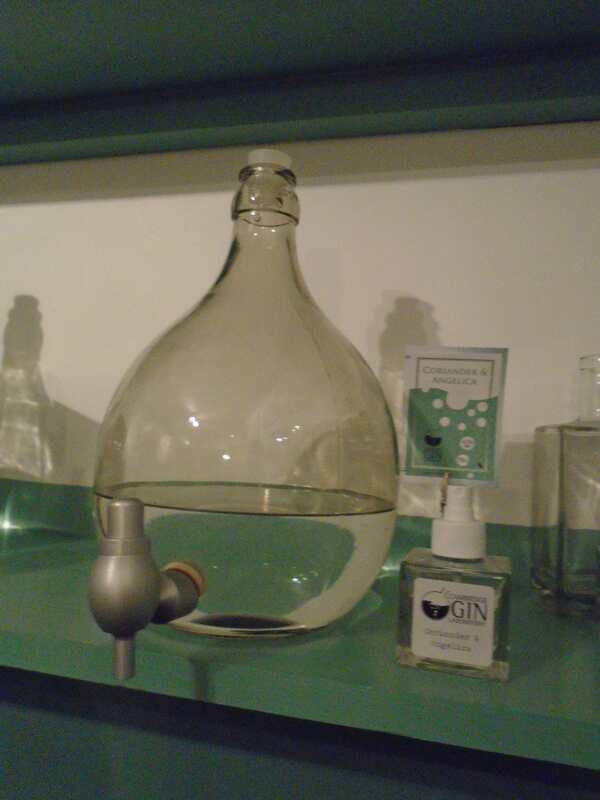 There are various events available including a tailoring option to create a unique gin. Gin is actually juniper-flavoured vodka. The predominant flavour must be juniper. The juniper “berry” is used (which is technically a cone). No sugar. The nose of gin is often described as “piney”. Juniper was used for medicinal purposes for a long time. However claims that drinking gin is healthy are sadly untrue. 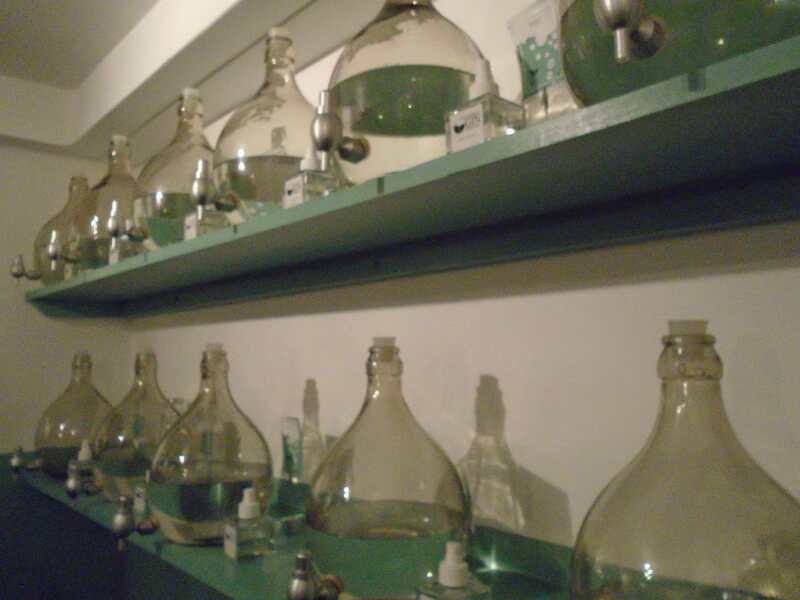 A monastery used to distil wine and float botanicals in it and used this as a treatment. Drinking this though was not tasty so they started to sweeten it. Traditional gin was produced in the Low Countries (Dutch) in the 15th Century. Jenever was their name for juniper. The English fought the Dutch in the 30 years’ war. Soldiers began to be given alcohol before they went into battle – it became referred to as “Dutch courage”. The English then started to make their own gin. The gin craze was between 1720 and 1751. This could be thought of as the first drug war. In the poor areas of London 1/3 of households were making and selling gin. However there was lots of methanol left in it which is poisonous. Some sellers cut the result with turpentine which is poisonous. They were drinking 80% ABV in pints – like beer. They became very addicted. The Gin Acts 1751 started to legislate gin production. William Hogarth 1751 creates two paintings Gin Lane is political propaganda intended to encourage people to switch back to beer (Beer Street). Gin was still allowed to be drunk however. The theory is that Hogarth was paid by the beer industry to encourage people to drink beer. The Gin Act was passed. After crop failures and attempts at alternative beverages – they eventually got better at making gin. Alcohol fermentation, involving yeast processes on sugar, produces heat, carbon-dioxide and ethanol (together with other alcohols). ABV (ethanol by volume) the maximum that fermentation achieves is 15% ABV. (You can heat the result to make it stronger). To distil – put the alcohol in a still – heat it. It starts to boil and evaporate. The outlet tube is cooled in water (it is coiled to increase its surface area). You track the temperature and collect the low boiling point liquid and dispose of it, this is referred to as the “head”. You collect the middle boiling point liquid and keep it. You collect the higher boiling point liquid referred to as the “tails” and dispose of it. In this way you get to concentrate what you want. In vodka you remove a lot of the impurities, this produces 96% alcohol. In whisky you keep some impurities by retaining a greater heat range, this affects the flavour. Gin started to be recognisably gin in the early 19th century – juniper is added during the distillation. Juniper flavour becomes incorporated into the gin. They also started to use continuous distillation – here a huge still uses plates to draw off the distillate at the correct temperature range. Gin now starts to taste nicer – it becomes fashionable to have unsweetened gin. 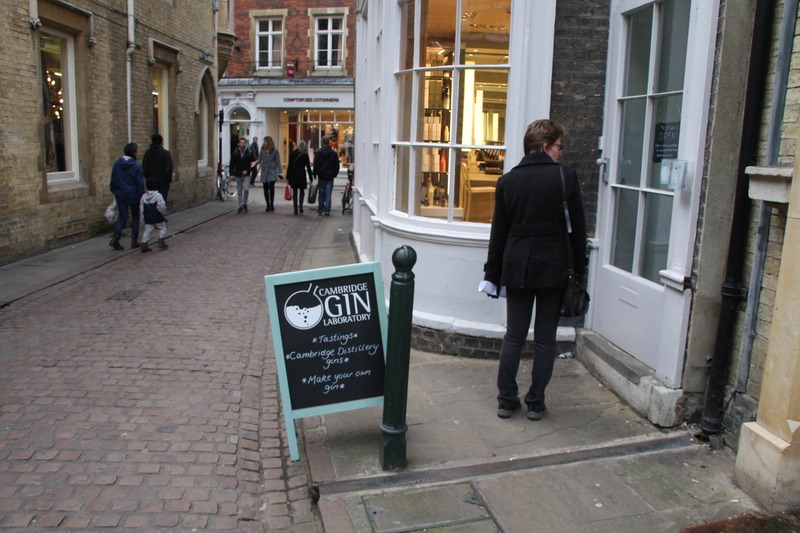 London Dry Gin became fashionable – today this is a subcategory of gin. London Dry Gin started in London but not made there anymore. It is dry – not sweet – you must use real botanicals – these must go into the distillation pot and not be added afterwards. Gin – is a shortening of jenever the Dutch for Juniper. Today other botanicals (plants) are used e.g. rose petal, cherry blossom, coriander seed, juniper cone. These react differently to heat – the heat is high so the botanicals are added at different times – this is like adding ingredients in cooking. You treat each botanical with the level of heat that suits it. The boiling point is related to atmospheric pressure – reducing pressure reduces the heat needed for boiling. 1 botanical is added at a time – you distil different botanicals. What comes out is not a gin, it is a flavoured distillate. Then you blend the distillates. However it needs a basis of London dry gin. Therefore you can blend your own gin. The distillery has 100s of distillates. 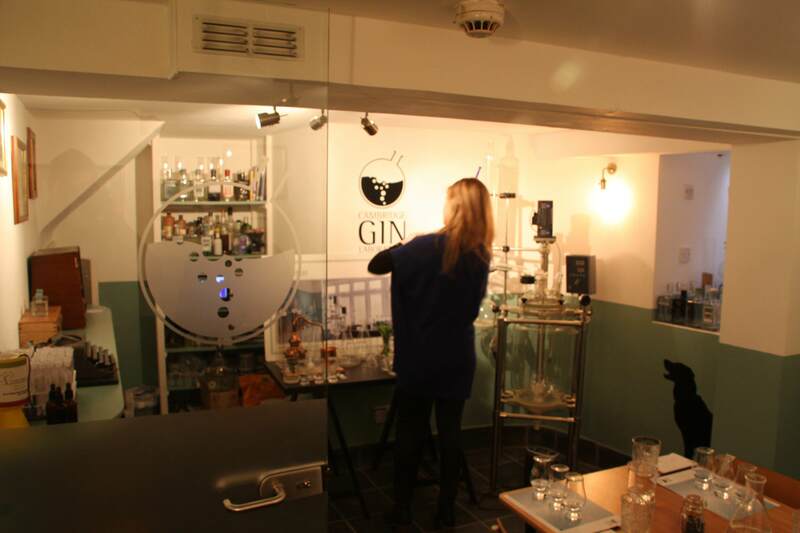 It is tailoring gin to individuals, bars, and restaurants. You can use delicate things in gin e.g. cucumber. Hendricks add the flavour afterwards – you can make a lot more gin this way – but not a London Dry Gin. 1 gin run takes 1 hour – there are 4 people in the company. When we arrived we had a gin to start with which was a standard London Dry Gin with a fever-tree tonic. I rather liked this. However we also got to use atomisers to spray gin directly into the mouth (well after some practice – the first squirt was directly into my eye). Atomisers contain the same spirit as the demijohns on shelves around the walls. They are used to allow tasting without consuming a lot of gin. Brands feel it is important to be traditional – to have this as part of their brand. Wheat is the basis of gin, potato potcheen (Poitín). Gin must be a neutral spirit – the basis does not have to be wheat, however if it is not wheat or potato then this fact must be listed on the bottle. Potato vodka is slightly oilier. Rye is slightly spicier (to a trained palette). To make comparisons involves a system for tasting gin which needs consistency and needs a standardised language. Tasting is an ability that develops from training & experience. Room temperature is best to identify botanicals. After the initial gin on entry and trying the atomisers there were 3 gins to try, these were sat on the table protected by glass lids. The first apparently had rose and violet petals in it. The sequence is first mouth feel – it should feel somewhere between milk and water – medium. I have the palette of a straw bale I established. There is no sweetness added – when you distil – sugar does not carry over, hence the distillate from pineapple has no sugar. What you can have is associative sweetness – this reminds you of sweet things for example florals gives this effect. 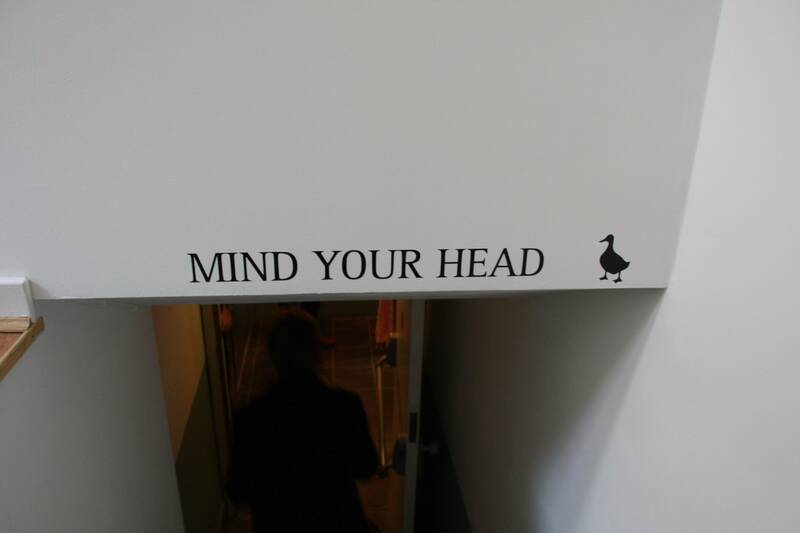 (It’s all in the mind in fact). It also had blackcurrant leaf – which gives a fruity flavour and basil, angelica, rosemary. Angelica is very common in gin – it is slightly spicy. In tasting you want to linger a little not too short. You don’t have to prefer one that wins awards – as this is a measure of how well it is made rather than if you like it. The Cambridge Distillery make different gins for different bars – Midsummer House has a herbal garden – we use those herbs in their gin. Pint shop – Peas Hill we use peas in their gin. College graduation gins – they forage for flowers in their garden – buy the gin which is unique to that year. Usually you have to go to the venue to taste their unique gin. Japanese gin has become a retail product (this is the second gin that we tasted). Nobu in London wanted one. It was made with a team of chefs inspired by botanicals used in Japanese cooking. This is light in intensity, the spirit is the same though. The botanicals are different, Juniper, cucumber, sesame, schiso leaf, almonds (it is marzipany), sanshō pepper (a bit perfumy), yuzu. Botanicals are affected by the weather and are used seasonally. Each year there are seasonal gins. The ones in spring/summer are lighter. The ones in autumn/winter are more warming. Each gin is therefore non-re-creatable. 100 bottles of each one are made and these sell quickly. 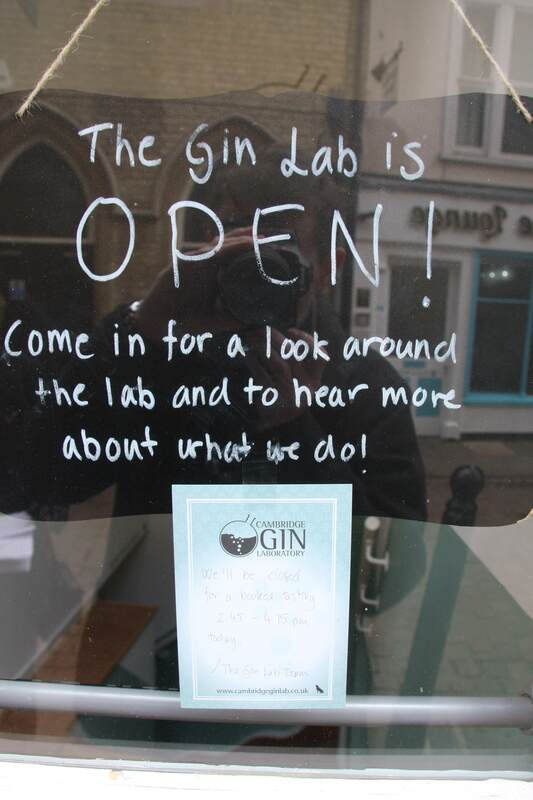 The Dog – the black Lab is the lab dog he/she is why this place is called a gin lab . They capture the lightest 1% of stuff that evaporates referred to as the angel’s share of gin. They have made an angels share gin at £2000 a bottle. They produced about 6 bottles, all sold quickly. Given how great our session was these will also be worth a try. Afterwards they give you a voucher to try a cocktail in the bar next door (accessible underground). The bar is on Trinity Street. This is at 2648 Cambridge. Great cocktails which may make you want to stay.